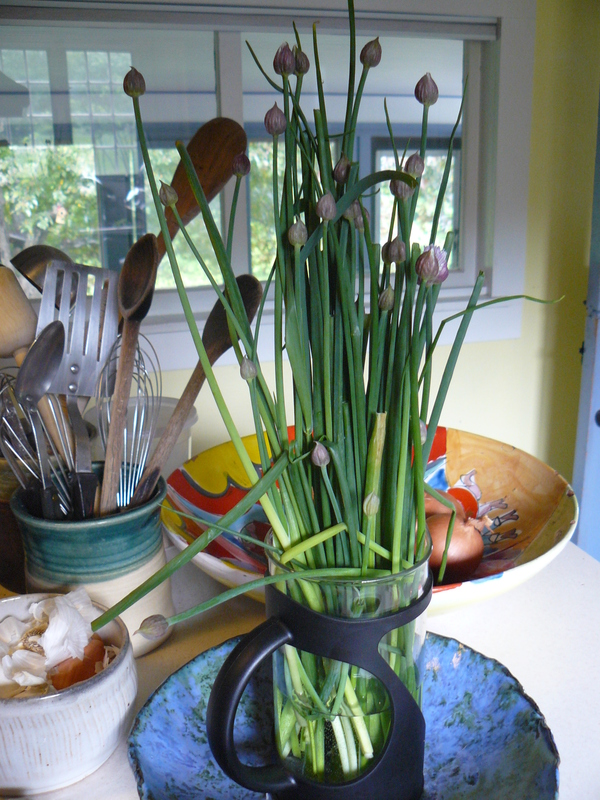 The new item at the farm this week was fresh chives. A huge pile of them, thick and green and gorgeous. I took a very large bunch. Check. Driving home the image of spring fritters now came fully into view. 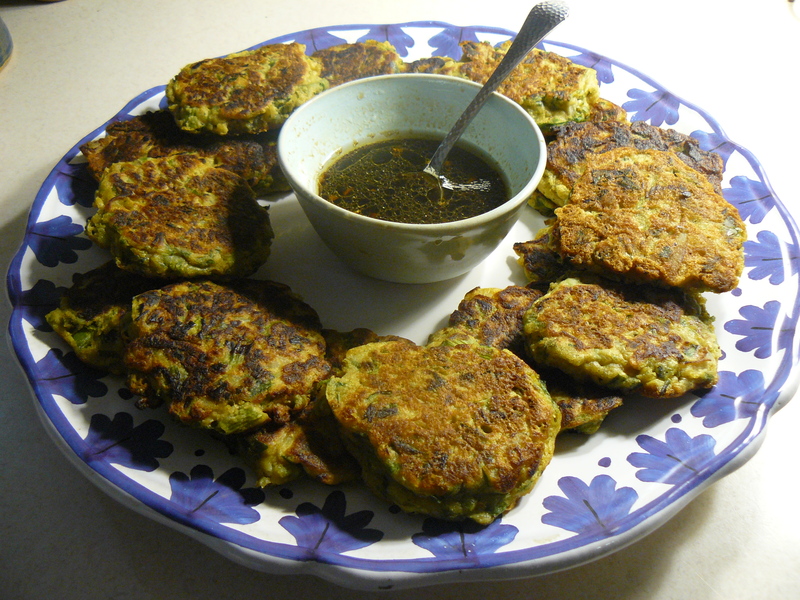 I barely got everything put away before I had three different cookbooks open consulting my favorite fritter recipes, one featuring artichokes, another zucchini, another leeks, comparing ingredients, noting similarities in process. I finally settled on the leek fritters recipe from Yotam Ottolenghi’s book of gorgeous vegetable recipes called ‘Plenty’ as a base. It would have to be adapted of course. I had most of the ingredients, but not all of them. I begin with the substitution for the leeks. The recipe calls for one pound of total trimmed weight of leeks. Careful to respect proportion and process, I clean and trim the asparagus and radish and pile pieces on a one pound kitchen scale to measure. 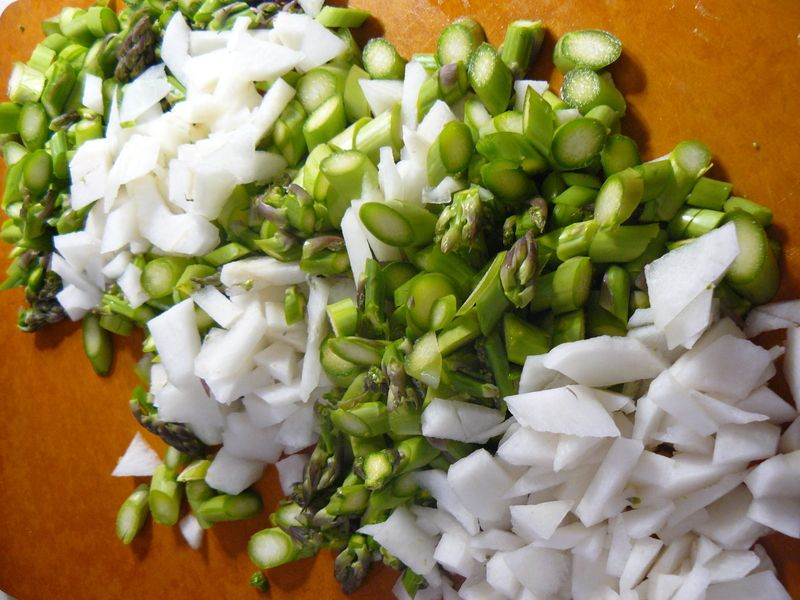 There is about twice as much asparagus as radish and this seems good. There’s no way to really simulate cutting the leeks into ‘scant 1 inch slices’, so I just cut both vegetables up into large pea size chunks. it becomes clear they will be the substitution for the 5 finely chopped shallots called for in the recipe. I chop what appears to be about a cup and a half’s worth and put all three vegetables into a large sauce pan with a third cup of olive oil to slowly saute on medium heat until just soft, about 12 minutes. Transfer to a large bowl to cool. Ottolenghi’s recipe is rich in spices and I enjoy this next part of measuring cumin, coriander, cinnamon, cayenne (as replacement for red chile), turmeric, chopped fresh parsley, and a little salt & sugar, and adding all to the cooled vegetables. What an aroma! It already feels like a party inside the bowl, the blend of distinctive personalities already making a happy hum. And importantly, no one flavor seems more dominant than the other, just a good happy blend. The recipe then calls for beating a single egg white into soft peaks. I do this with some concentration, enjoying the sound of the whisk caressing the edges of one of my mothers small ceramic bowls, just big enough to contain the white foam that forms and gets folded gently into the spiced vegetables. In another bowl, a batter is made with flour, baking powder, egg, milk and melted unsalted butter. Once again I have to make substitutions but keep the proportions the same, a mixture of unbleached white and garbanzo bean flour for the ‘self-rising flour’, my homemade almond coconut milk for the milk, and salted butter. 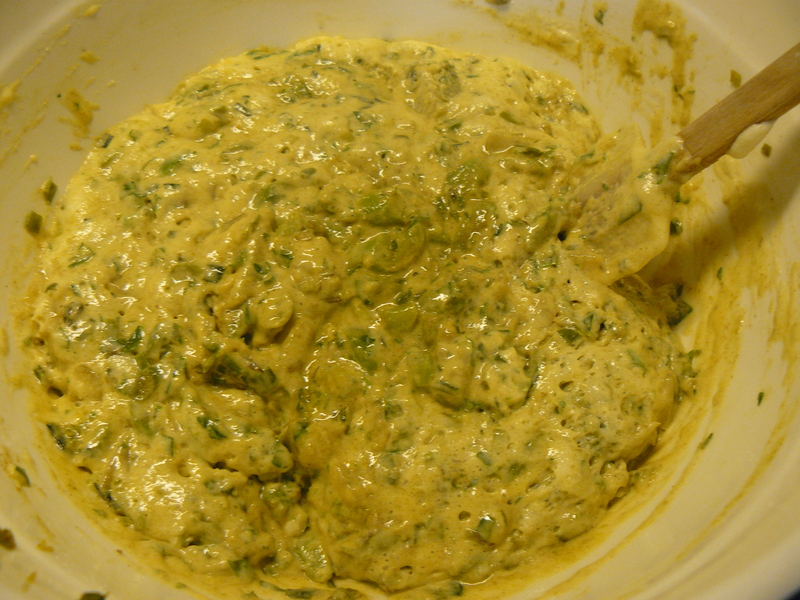 The creamy batter then gets gently folded into the vegetables until just mixed. 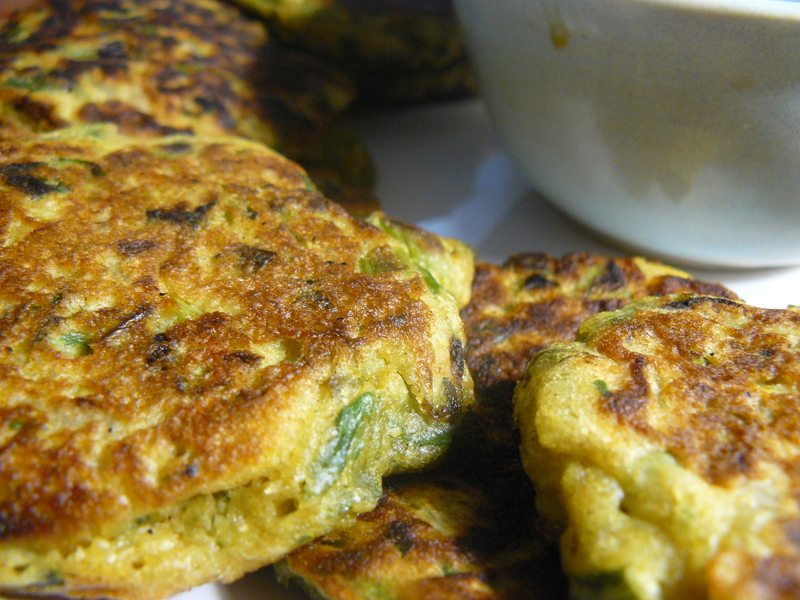 I use the locally made sunflower oil instead of olive oil to fry the fritters. With my 10 inch round cast iron grill, I’m able to make 7 appetizer/finger size fritters at a time, frying 2-3 minutes each side, for a total of 21. I have no idea how many people will be at this party, but finished, there are enough fritters to fill a plate..! I have none of the ingredients for Ottolenghi’s accompanying creamy yogurt sauce recipe. So I just color completely outside the lines here and make a dipping sauce from fresh chopped ginger, tamari, fresh lemon and sunflower oil. Reminiscent of the kind of dipping sauce served with Chinese dumplings. Perfect. 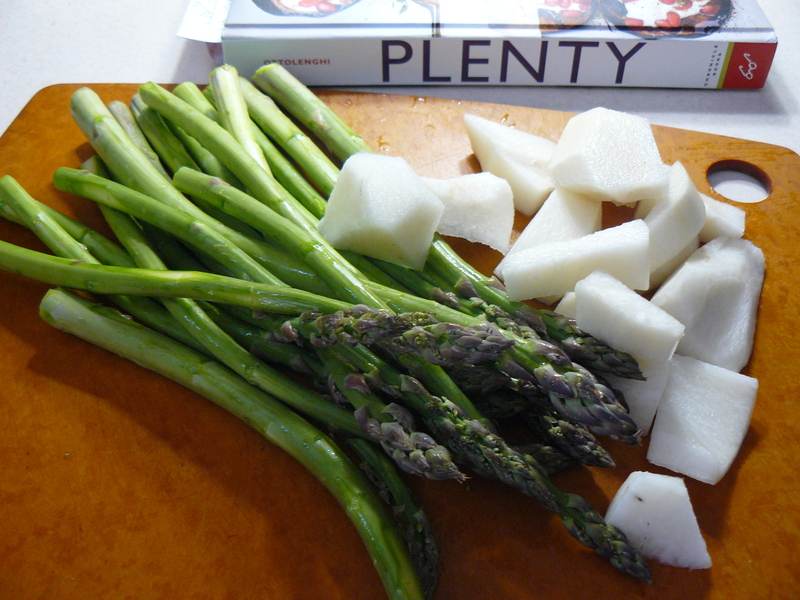 Cut radish and asparagus into large pea size pieces. Saute in olive oil with chives for about 10-12 minutes, medium heat until just soft. Transfer to a large bowl for cool down. Add spices, sugar and parsley. Whisk egg white to soft peaks and fold into cooled vegetables. In another bowl, mix flours, baking powder, milk, whole egg, coconut and melted butter to make smooth batter. 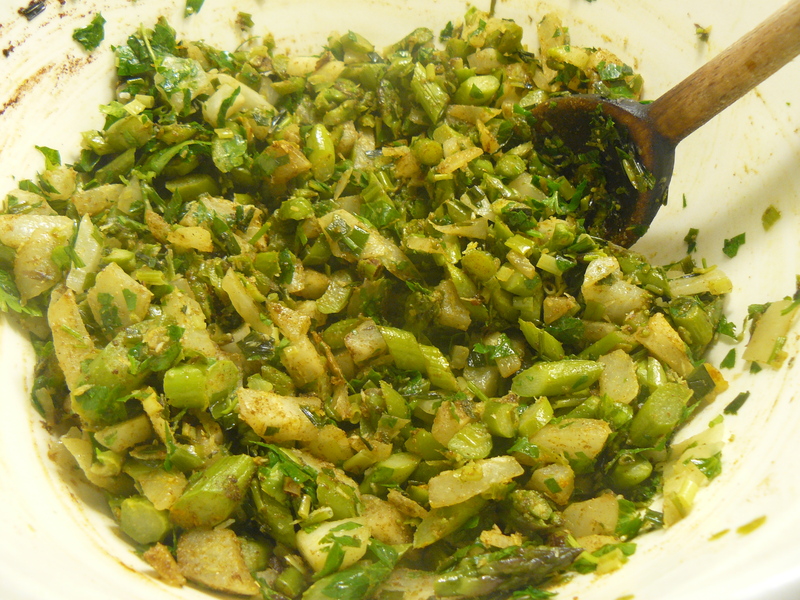 Gently fold into vegetable mixture. Heat skillet and add sunflower oil to just cover surface. Drop heaping 1/8 cups portions onto pan to form fritters. Fry 2-3 minutes each side until golden and crisp. 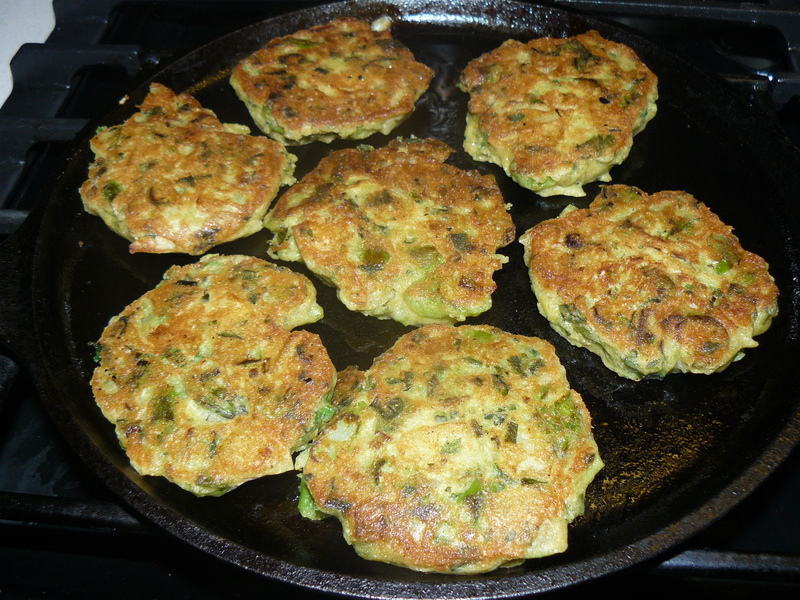 Yields about 21 appetizer size fritters. Serve with dipping sauce of choice and a cold crisp dry white wine! Mmmm, what a yummy breakfast that will be!